FWA President Topher Hamblett and Andrew Kromah visited eleven radio stations in twelve days. Hamza Kanu, program presenter, and Andrew Kromah, IRN Chairman, at Radio Bankasoka, Port Loko, Sierra Leone. 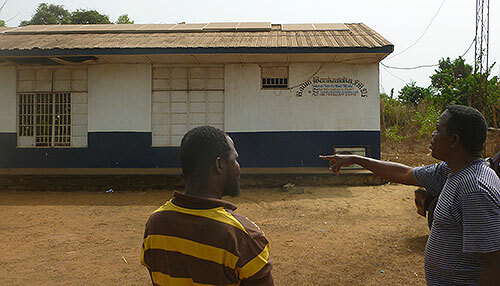 Rooftop Solar Panels, Radio Bankasoka 97.5FM, Port Loko, Sierra Leone. In February I visited Sierra Leone to assess the impact of FWA’s response to the Ebola crisis, assess current needs and priorities, and identify new opportunities to support independent radio. I traveled throughout the country with Andrew Kromah, who is Chairman of the Independent Radio Network (IRN). 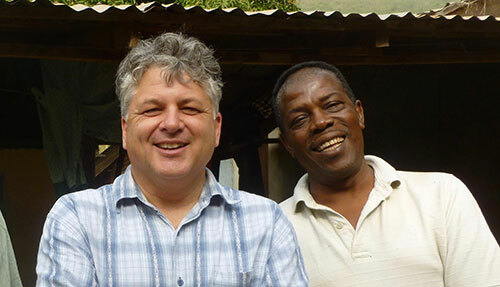 Andrew owns two radio stations and is a radio technician who trouble-shoots technical problems and trains staff on equipment maintenance and repair. We visited eleven radio stations in twelve days. Some were in urban areas, others in remote, rural regions. Feedback from the staff, board members and communities served by radio affirmed that FWA emergency grants made a huge difference by maintaining the flow of information during the crisis. 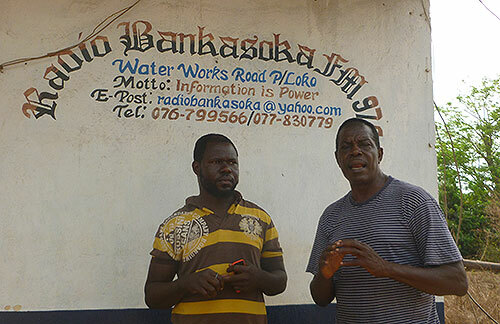 FWA helped community radio stations save lives. Andrew and I visited 2 solar-powered radio stations, and explored opportunities for FWA to support the replacement diesel or gasoline-powered generators with solar-powered systems. During my visit, Sierra Leone President Ernest Bai Koroma announced that national elections would take place in 2018. The political environment is already heating up. Tension within the two major political parties – the ruling All People’s Congress (APC) and Sierra Leone People’s Party – is growing as potential candidates jockey for position. The Independent Radio Network (IRN) and its 33 members stations will be counted on for pre-election coverage, polling-day results, and post-election news, and for fostering a climate of peaceful conduct and transparency. I am deeply grateful to FWA donors who make all of this possible. You have helped the people of West Africa respond effectively to the Ebola crisis, and positioned radio stations to help communities rebuild and prepare for the challenges ahead.